A 65-year-old Californian woman has saved the life of her husband, 70, by fighting off an attacking mountain lion with a small log and his pen. Jim and Nell Hamm were walking in the Prairie Creek Redwoods State Park when the cougar wrestled Jim to the ground. Nell started hitting the animal with the log but it kept hold of Jim's head. She then tried to stick the pen in its eye. The cougar eventually let go. Mr Hamm is in fair condition after having his lips stitched back together. He also suffered scalp lacerations and puncture wounds. "She saved his life, there's no doubt," said Steve Martarano, spokesman for the Department of Fish and Game. The park, 320 miles (515km) north of San Francisco, was closed after the incident and wardens tracked down and killed a pair of lions near the trail where the attack happened. The couple are experienced hikers but said they had not seen a mountain lion before. 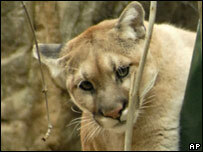 Mrs Hamm told Associated Press news agency that when the cougar attacked, her husband did not scream. "It was a different, horrible plea for help, and I turned around, and by then the cat had wrestled Jim to the ground." "So I got the pen and tried to put it in his eye, but it didn't want to go in as easy as I thought it would." The pen bent, so Mrs Hamm went back to the log. The cougar eventually gave up. It stared at her as she screamed and waved the log, before it wandered off. 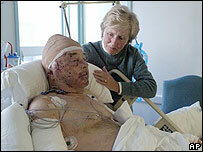 After the attack, the couple had to struggle to a trail head 400 metres away, where Mrs Hamm gathered more sticks to fend off any more attacks. A passing ranger then summoned aid. The dead cougars are undergoing tests to determine if either was responsible for the mauling. Mountain lions are usually tawny in colour with black-tipped ears and range from British Columbia to the southern tip of South America. Adult males can grow to eight feet in length (2.4m) and weigh on average 150lbs (68kg).